This is an Only Connect Wall, like the several (some examples here) that have been posted here in the past. The goal is to divide the 16 words below into 4 thematically connected groupings of 4 words each. I've been lurking on Puzzling.SE and enjoying the puzzles for a little while now but this is my first shot at actually using the site as a user so I apologize in advance for any breaches of etiquette. I intended for this one to be at least as difficult as the average wall, but it seems puzzle creators here are regularly surprised by how quickly their creations get solved, so I'll withhold any hints for the time being. If it doesn't get solved quickly I can post some hints and/or confirm correct groupings. Gambler, Confirmation, Outcome, Omission: These all represent various types of cognitive bias. Gambler's Fallacy, Confirmation Bias, Outcome Bias, and Omission Bias. 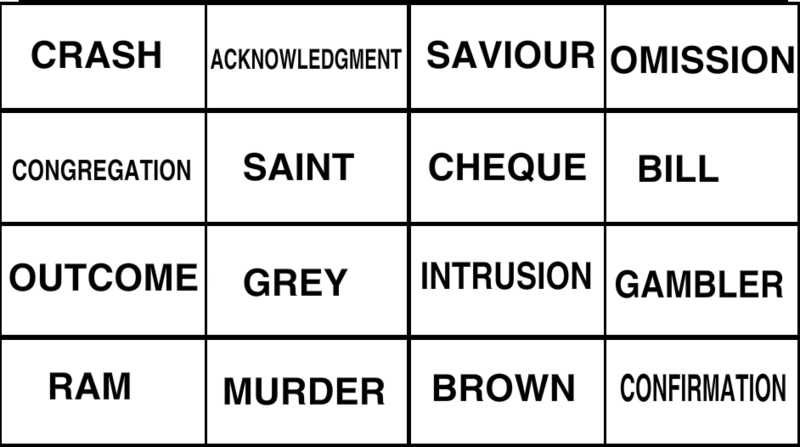 Outcome Saviour Gambler Grey okay I am not that sure of group 3.